�Go West!� For more than a century, this American adage has inspired many of us to pursue our dreams. Sharon Taylor certainly has. She takes on life with unwavering optimism and sees a world of boundless opportunity. Sharon believes that you should make the most of each opportunity, giving your best every time one comes your way. She will tell you that her pioneering spirit has not only made her life an extraordinarily satisfying one: it has also shaped her approach to real estate. Her approach takes her clients� dreams of that �just right� place to call home and makes it a reality. Wichita is Sharon�s lifelong home. She was born in this All-American City, growing up on its West Side in a family of five children. As the youngest, Sharon had the benefit of older siblings to learn from. �Being the baby of the family,� Sharon explains, �I learned a lot of lessons just by watching my siblings grow up.� She also learned the value of hard work and giving your best from her mother and father. These loving, industrious parents worked in the aircraft industry and instilled their children with a hearty work ethic and a caring commitment to family and community. 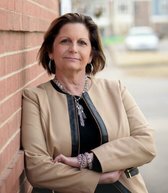 Sharon�s commitment to community is evident as she uses hometown knowledge to help others realize their real estate dreams. Get to know Sharon and you will quickly see why she makes such a positive lasting impression. Start by reading the testimonials of a few of her many satisfied clients. Then give her a call. She�s ready to chart your path to purchase or sales success whenever you are.